Juice Box, a personal media player from Mattel, will feature category exclusive, full-color video content from some of today's hottest music, television and action sports personalities; play MP3 music files; and enable viewing of digital photos. 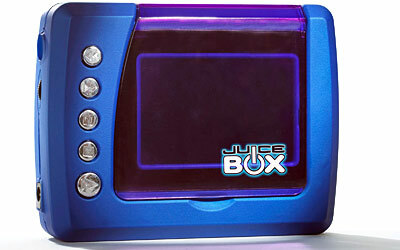 Juice Box is designed to meet the lifestyle and entertainment interests of today's tweens. One of the smallest and lightest personal media players on the market to date - easily fitting into almost any pocket - the player enables tweens to play back videos in full-color and in stereo sound with headphones. Built-in firmware that will play downloaded music from MP3 files and enable photo viewing through an expansion pack. Video, music and photo content for Juice Box are delivered through proprietary media cards called Juiceware that can store up to 176 minutes of plug-and-play entertainment. Available titles from Mattel for Juice Box will include tunes and videos from today's hottest music acts; cartoon, reality and other popular television programming; action sports videos; and behind-the-scenes footage of entertainers popular with tweens. Among key content players with whom Mattel has partnered include BMG Music - for music videos from popular, contemporary artists; Cartoon Network - for animated shows such as Ed, Edd n Eddy and Kids Next Door; and 4Kids Entertainment - to feature content from shows such as Yu-Gi-Oh and Teenage Mutant Ninja Turtles. Additional content partners and Juiceware titles - including many from popular music - will be announced closer to launch date. A special Juice Box MP3 Starter Kit comes with a standard Secure Digital or Multi Media Card, enabling tweens to play MP3 files or view JPEG digital photo files transferred from their PCs. The Starter Kit also provides tweens the ability to rip audio CDs into MP3 files and then download and play back. Powered by three AA batteries, Juice Box can play hours of content without interruption or skipping, making it perfectly portable. Its approximate 3-inch video screen features a "flip" screen cover to protect it while being transported in a backpack, book bag or bike pouch. Listeners can enjoy stereo sound through headphones, or listen with friends through a built-in speaker. Highly stylized with a soft-touch texture, Juice Box will be available in three color choices at launch (bright red, cobalt blue and lime green) for an estimated retail price of $69.99, which includes sampler content from 4Kids and Cartoon Network. Juiceware media cards featuring Juice Box content will be available separately from an approximate retail price of $9.99 for two episodes of animation, up to an approximate retail price of $24.99 for full-length features. Juiceware video is compressed with proprietary technology developed by 4Kids Entertainment. The Juice Box MP3 Starter Kit, which includes a blank 32MB SD or MMC card, software, Flash card adaptor and USB card reader/writer, will be available for an approximate retail price of $44.99. Additional accessory choices will include headphones, a sleek carrying case, and car and home adapters to extend battery life.